Nyingma (Tib. རྙིང་མ་, Wyl. rnying ma) — the Nyingma, or Ancient school of Tibetan Buddhism is the name given to the followers of those original translations of the teachings of the Buddha into Tibetan which were carried out up until the time of the Indian translator Smrtijñanakirti in the late tenth century. They are known as the ‘Earlier Translation School‘, Ngagyur Nyingma (Wyl. snga 'gyur rnying ma), distinguishing them from the ‘New Schools’, Sarma, such as the Kadam, Kagyü, Sakya, and eventually Geluk, which followed the later translations made from the time of the great translator Rinchen Zangpo (958-1055) onwards. Central to the Nyingma tradition is the extraordinary figure of Padmasambhava, Guru Rinpoche, the great guru who introduced Buddhism to Tibet in the eighth century. Invited by the King Trisong Detsen upon the advice of the great Indian Khenpo Shantarakshita, Padmasambhava is said to have stayed in Tibet for more than half a century. He travelled throughout the country, teaching and practising, taming the forces that were inhibiting the Buddhadharma, and infusing his blessing into the whole landscape of Tibet. As a result, the teaching of Buddha came to permeate the fabric of the lives of the people of Tibet, and the very vitality and success of Tibetan Buddhism owes everything to his kindness. Padmasambhava founded the first monastic university of Samye, where many Indian panditas, such as Vimalamitra, came together with Tibetan translators to translate the Buddhadhama, and the first seven Tibetans were ordained as monks. At Chimphu, he opened the mandala of the Mantrayana teachings to the twenty-five siddhas of Tibet, who included King Trisong Detsen, Yeshé Tsogyal and Vairochana. For millions of practitioners down through the centuries, Padmasambhava has continued to be the source of their realization, and the inspiration which breathes life into the heart of the practice. The Nyingma teachings are divided into the Long Transmission (Tib. ring gyü) of Kama and the Short Transmission (Tib. nyé gyü) of Terma; other teachings were received by masters directly in Pure Visions (Tib. dak nang) from deities or gurus, in experiences or in dreams. Particular to the Nyingma school is the division of the teachings into nine ‘yanas’ or vehicles. The special tantras of the Nyingmapas are the three inner tantras of Mahayoga, Anuyoga and Atiyoga or Dzogchen. Some of these appear in the Kangyur, the ‘Word of Buddha’, but there is a separate collection, the Nyingma Gyübum, ‘Collected Tantras of the Nyingmapas’. The Nyingma Gyübum was first compiled by the great tertön Ratna Lingpa (1403–78) after similar compilations of texts made in the 14th century, such as the Kangyur and the Tengyur, had omitted many of the Nyingma tantras. In the Nyingma School there are two Sanghas: the monastic and yogic communities. The Nyingma tradition of Vinaya, stemming from the Buddha’s son Rahula, follows the Maha-mulasarvastivadin ordination lineage, which was first brought to Tibet by Shantarakshita. The Nyingma Vinaya tradition reached its pinnacle in the eighteenth century with the reformer Dzogchen Gyalsé Shenpen Tayé, who revitalized monastic standards of discipline and scholarship. There were more than a thousand Nyingma monasteries in Tibet, and the Nyingma tradition spread throughout the whole of Tibet and the Himalayan regions of Bhutan, Sikkim, Nepal and Ladakh. 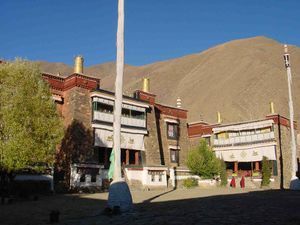 In Central Tibet, the most important were Orgyen Mindroling, built by Minling Terchen Gyurme Dorje (Terdak Lingpa) in 1676, and Tupten Dorje Drak, established by Rigdzin Ngakgi Wangpo (1580–1639) in 1610. In Kham, East Tibet, Kathok was founded by Kadampa Deshek in 1159, and Palyul by Rigdzin Kunzang Sherab in 1665. In 1685 the Dzogchen Monastery, destined to be the largest and one of the most influential of the Nyingma monasteries in East Tibet, was founded by Pema Rigdzin, who was the first in the line of Dzogchen Rinpoches. Shechen was founded in 1735 by the second Shechen Rabjam Rinpoche Gyurmé Kunzang Namgyal. There were also a number of Nyingma monasteries in Golok and Amdo provinces, e.g. the Dodrupchen and Tarthang monasteries. The Supreme Head of the Nyingmapa is a position that was established, primarily for administrative purposes, only while in exile in India. In Tibet no one served as the head of this school. First this title was given by H.H. the XIV Dalai Lama to Dudjom Rinpoche. in 2001, to Minling Trichen Rinpoche. in 2012 the title passed to Taklung Tsetrul Rinpoche, who passed away in 2015. At the Nyingma Mönlam in Bodhgaya, January 2018, Gyurme Tenpa Gyaltsen, the Fourth Katok Getse Rinpoche was appointed to be the supreme head of the Nyingma Tradition for three years. This page was last edited on 21 November 2018, at 11:23.